This collection picks up where Ballads EZkeys MIDI left off and continues to read between the lines of piano inspired ballad music of the past few decades. From intimate singer/songwriter material to, epic arena pop and modern-day soul. 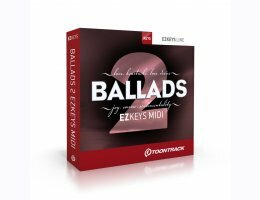 Ballads 2 EZkeys MIDI simply offers more of the timeless playing styles and chord progressions you can use as your foundation for a near infinite number of songs. The deep layers of musical influences coupled with EZkeys’ powerful songwriting features will be the stepping stone for many a song you have yet to write. Here is the paint and the canvas – the rest is up to you. Start creating, it’s EZ! An extensive collection of chord progressions and playing styles for ballad music.